This worked on older build. But with the new install /com.apple.NetworkBrowser is no longer in the /Library/Preferences directory. I will never need or want to use "remote disk" can someone tell me how to get rid of it? Thank you. First, I'd be wary of removing it. I know that "no one uses CDs/DVDs any more" but every once in a while, someone breaks one out, like at a conference or a gift shop, etc. But, if you really want to remove it from the sidebar, it's quite simple. Very Mac-like. 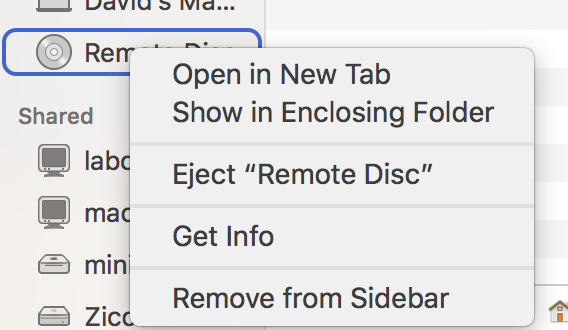 Just right-click the Remote disc and select "remove from sidebar." Not the answer you're looking for? Browse other questions tagged mac hard-drive sierra remote-control . Mac Book Pro - View movie while keyboard disabled? copying data from a removed mac book pro hard drive to another working mac book pro.